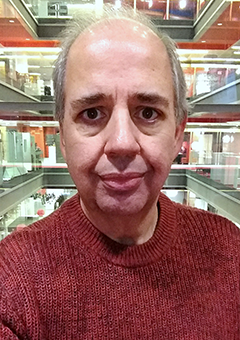 My name is Martin Ayub and I am the Editor of Pinball News which means I get to write some of the articles, collaborate with our team of contributors to publish their articles, and keep the website up and running with all the latest reports, diary events and other housekeeping. I started Pinball News back at the end of 1999. It developed out of my own personal website which had largely consisted of reports from pinball and trade shows. The catalyst for change was the closure of Williams’ pinball division in November 1999. When that announcement came, everyone was saying pinball was dead, finished, buried. I knew there was a vibrant community of pinball enthusiasts, home game buyers and avid collectors who hadn’t suddenly vanished and still had a huge appetite for the game. What was needed was someone to speak out for them. To show the world that new games were still being made by Stern Pinball, that pinball machines were still being actively traded, that pinball shows were still being held and that all the pinballs out on site were still there to be played, still making money for operators and site owners. The problem then was the need for a reliable, independent, well-written source of information about what was really happening in the pinball world, and that’s why Pinball News was created. 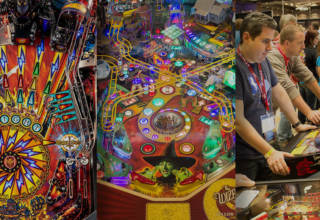 The main areas covered then, as now, were; industry news, new game reviews, reports from pinball shows and information about where to play. In short, News, Games, Shows and Sites. You’ll find them all in the menu at the top of this page. As the website grew, it stared covering a few more areas where comprehensive, reliable information was simply not available. 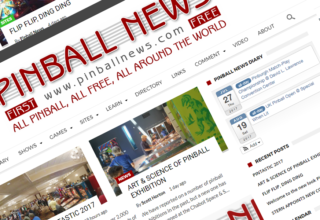 So the Diary page now lists as many pinball events around the world as we can find, while The Directory does the same for pinball machine and parts suppliers as well as game repairers. 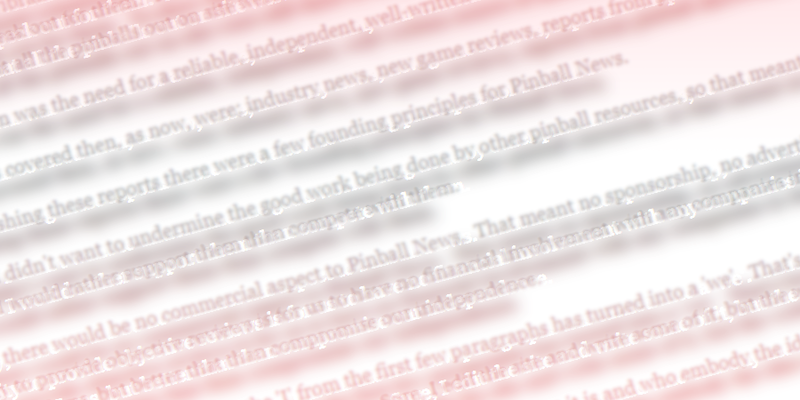 Besides publishing these reports and features, there were a few founding principles for Pinball News. First of all, I didn’t want to undermine the good work being done by other pinball resources, so that meant no classified ads and no discussion forums. There are plenty of others places doing those, and I would rather support them than compete with them. Secondly, there would be no commercial aspect to Pinball News. That meant no sponsorship, no advertisements, no subscriptions and no donations. The only way to guarantee independence and the ability to provide objective reviews is for us to have no financial involvement with any companies in the business. Sometime that means turning down deals and rejecting special treatment from certain firms, but better that than compromise our independence. Finally, you may have noticed how the ‘I’ from the first few paragraphs has turned into a ‘we’. That’s because Pinball News is not my site. It is the collaborative work of all the dozens of writers who have contributed or continue to write for us. Sure, I edit the site and write some of it, but the writing stays fresh thanks to the variety of voices and opinions found in our articles. So, a huge thanks to our team of writers who make Pinball News what it is and who embody the spirit of free, independent and intelligent pinball journalism. If you like that concept too, why not join us? Such a great site, Martin. I throughly enjoy the wonderful stories. They’re all so well told, with tons of great photos. Thanks so much for your amazing contribution to the community.